Solar pumping system is a series-parallel absorb sunlight radiation energy through solar panels and convert it into AC power by inverter to drive centrifugal pump, irrigation pump, axial flow pump, mixed-flow pump of deep well water pump system. 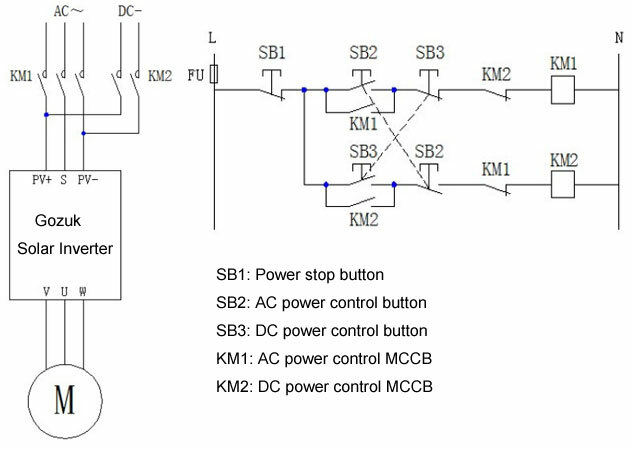 According to the change of intensity of sunlight, solar pump inverter system adjusts output frequency in real time, output power close to the sun cell array maximum power. 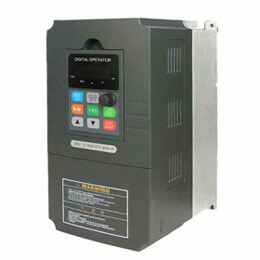 Solar pump inverter, also named solar variable frequency drive (VFD): electrical energy from photovoltaic solar panels to drive AC motor water pumps. 1. 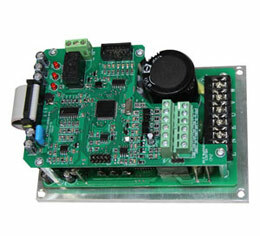 Internal with Maximum Power Point Tracking (MPPT) controller system, it can track maximum power of solar panels, and effective to increase the output power of the solar panels. 2. Implement work throughout the day. It can work from sunrise to sunset, greatly improving the water pump effective working hours a day. 3. Automatically adapt to changes and cloudy weather. Effectively avoid the traditional pump suddenly overcast, the system will stop phenomenon. 4. System has strong anti-jamming capability, in the depth of 200 meters, the system can still be reliable work. 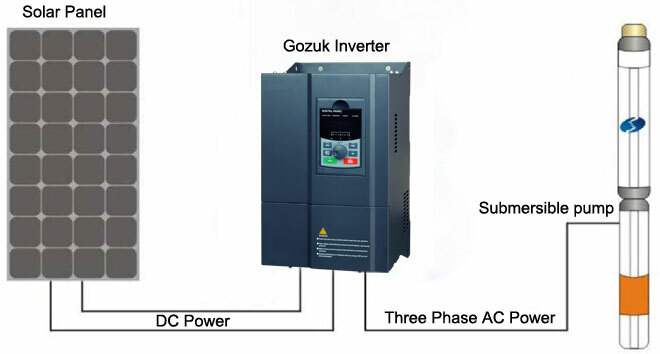 Solar pump inverter built-in MPPT controller, intelligent track maximum power point, fast response, high stability, efficiency is as high as 98%. 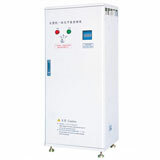 Input voltage from 130V DC to 350V DC drive three phase 220V AC water pump, input voltage from 350V DC to 650V DC drive three phase 380V AC water pump. 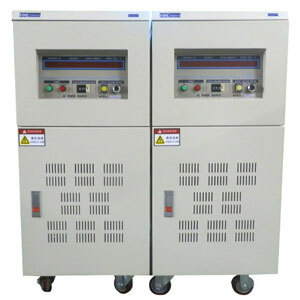 Protection for overcurrent, overvoltage, overload, anti-lightning etc. Smart operation, water level detection and operation panel to prevent overflow, dry pumping (optional). 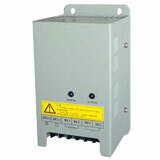 Infineon Module IGBT last longer. Automatic running when power on. Low noisy, lower rate for maintenance. At night or sunlight is not strong enough, the system can be connected to the grid. Grid and solar energy can switch, when power grid is not stable or power cut you could change to solar energy for supply power. The solar pump inverter can solve the problems of the traditional power instability or power can't reach area with water problems. Investment cost, use cost and maintenance cost are very low. Do not need equipped with battery, cost savings, more environmental protection. Environmental protection, realize CO2 zero carbon emissions. Solar pump inverter mainly used with solar system in remote region where power grid is impossible to reach or unstable power supply region of the hill afforestation management lead water project, supply water for river on both sides of the vegetation, soil and water loss prevention water supply project, the barren hills groves and other economy content of irrigation, natural ecological protection area desertification control water supply. 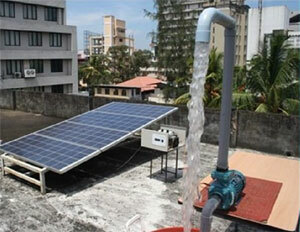 Supply water for lack of electricity remote mountain area, farm, school, hospital, factory and home. Remote region or unstable power supply area covering the areas of animal husbandry and water, irrigate for farmland and greenhouse. Solar pump inverter system is widely used in the desert greening, desert governance, agricultural irrigation, water supply, urban life water, pump systems, water purification, seawater desalination, etc.